A professor of sociology at the University of Oregon, John Bellamy Foster is also the editor of the socialist magazine Monthly Review. He has written widely on capitalism, Marxism and ecological crises. In this interview, Foster discusses why a Green New Deal is just an entry point to an ecological revolution, and why any economic-social system that hopes to address the climate crisis must transcend capitalism. The interview that follows has been lightly edited for clarity and length. Vaios Triantafyllou: Do you believe that combating the climate crisis is feasible within a globalized capitalist economy? The common liberal narrative is that financial incentives and economic regulations, along with booming clean technologies, can provide a cure to the problem (despite scientific evidence and the recent UN report claiming otherwise). 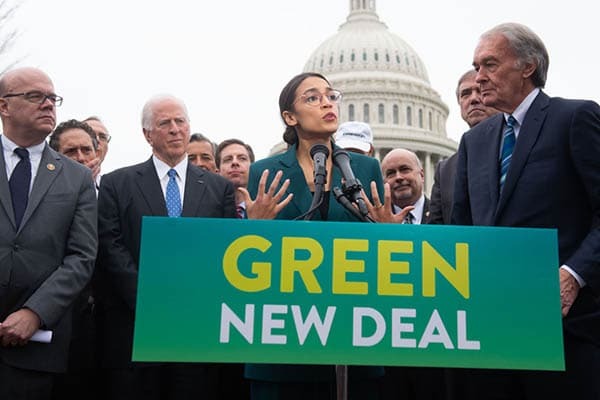 What is your position on the Green New Deal, as proposed by Rep. Alexandria Ocasio-Cortez, and what is the interplay between here-and-now and long-term, socialist solutions? John Bellamy Foster: We cannot deal with the climate crisis, much less the overall planetary ecological emergency, in an effective way while conforming to the logic of a globalized capitalist economy. But we currently live in such an economy, and we have a very short time in which to respond to climate change. So, it becomes a question of immediately choosing to steer society toward putting people and nature before profits, as opposed to what capitalism does, i.e. putting profits before people and nature. We have to go against the logic of the system even while living within it. This is what is meant by a “movement toward socialism,” as first articulated by William Morris. Capitalism is not just a system, it is a system of social relations and socio-metabolic processes, and we have to change many of those relations and processes radically from within and very quickly in order to deal with the current ecological emergency. In the long run, of course, we have to have a full ecological and social revolution, transcending existing capitalist relations of production. But right now, we are in an emergency situation, and the first priority is eliminating fossil fuels, which entails the destruction of what is called fossil capital. The object is to avoid what Earth system scientists are calling “hothouse Earth” where catastrophic climate change is locked in and irreversible, and which could set in a couple of decades or less. With respect to Representative Ocasio-Cortez’s proposal on the Green New Deal, I am impressed by some aspects of it. She calls for mass mobilization, which is indeed necessary. She also calls for innovative forms of financing, such as setting up a network of public banks to finance it directly, modeled after the New Deal, and through much higher marginal tax brackets on the rich and corporations, going back to what we once had in the United States. The revenues could be used to finance a massive shift toward solar and wind power. She connects this to a wide array of social issues. But none of this will really work, even if it were possible to legislate it, given the system, unless it takes on the character of an ecological revolution with a broad social base. Hence, a radical Green New Deal is, at best, just the entry point to such wider, eco-revolutionary change, involving the self-mobilization of the population. If it does not spark an ecological revolution, its effect will be nil. As far as your question on the role of financial incentives and regulation, none of this will work as a strategy. It would be mere spitting into the wind. What kind of financial incentives could be given to energy companies when they own trillions of dollars in fossil fuel assets, and they have a vested interest in this system? Exxon-Mobil has declared hey will extract and burn all the fossil fuel assets that they own, which are buried in the ground, because they own them and because they can profit from them—knowing full well that this would be a death sentence for humanity. There is no way that mere incentives are going to change that. So far, even the subsidies for fossil fuel exploration have not been removed. Regulation won’t work in the present system since corporations always capture the regulatory process. To alter the present political-economic-energy matrix would require changes in ownership of means of production—in this case, fossil fuels. It would not mean just the transfer of ownership but the destruction of trillions of dollars of financial assets globally, since fossil fuels would need to remain in the ground. One other argument by proponents of liberalism and the capitalist economy is that global competition will eventually bring about such technological innovation, with a subsequent reduction in costs, that will resolve climate problems (through such absurdities as colonizing other planets, etc.) Do you believe that this line of reasoning has any merit? I don’t believe it has any merit. There are no merely technological solutions to the climate problem, though technological innovations are necessary. There is a lot of talk about absolute decarbonization, as if this were simply a technical problem, and we could decarbonize completely while continuing to expand the capitalist economic system as before. Yet, mere innovations in efficiency are not going to do it. Cost reductions aren’t going to do it. We have to reach zero net carbon emissions globally by 2050, and as long as we are committed to pursuing the logic of profit before people and the planet, getting there is impossible. We have been increasing our efficiency in engineering terms steadily for hundreds of years, while our anthropogenic impacts on the planet keep on expanding. The reality behind this is what is known as the “Jevons paradox.” As economist William Stanley Jevons noted in the 19th century, every time an improved steam engine was developed, which burned coal more efficiently than before, the result was to burn more coal in the aggregate. This is because capitalism as a system is geared to economic growth and accumulation, not conservation. All efficiency gains are used for expansion and not to reduce aggregate throughput of energy and natural resources. We have been aware of the Earth-warming problem for half a century, and the system has failed to act while the problem has rapidly worsened. There has been no absolute decarbonization, detaching carbon emission and economic growth. In 2018, global carbon emissions increased by 2.7 percent globally, 3.4 percent in the United States, roughly in line with economic growth, while to avoid breaking the carbon budget in the next decade or two, we need to be reducing carbon emissions by 3 percent a year globally. In a word, the situation right now is dire. There are no technologies on the drawing board or that are feasible in cost terms that can solve these problems while continuing the burning of fossil fuels. The notion that technology will allow us to continue exponential accumulation without fundamentally altering our energy and our social order goes against the realities of both economics and physics. Our only way out of this epochal crisis is the immediate reduction in carbon emissions, which means keeping fossil fuels in the ground. That requires a direct confrontation with fossil capital. There is no other way. Obviously, we need to switch massively to solar and wind technology. But that in itself would not be enough. We have to change what we produce, what we consume and the amount of waste we generate. Our ace in the hole is that we can cut back on the enormous waste born of inequality in our society. But this has to do with the choices we make as a society, and it has to do with power and social relations. Nothing about our present society is efficient or sustainable on a macro scale. We can fix that if we so choose, but not by following the logic of private profit. In your opinion, what does a socialist environmental policy entail, and what are its main pillars? How does it incorporate clean technologies? Is it self-evident that the abolition of capital greed and the capitalist mode of production will resolve the climate crisis? If we first remove the shackles that capitalism places on society—which would require a long ecological revolution and the creation of a sustainable socialist society—there is a possibility that we will be able to deal with the problem. But that is, of course, no guarantee. It has to do with the kinds of social structures, institutions and agencies we create. It has to do with the changes in society. Still, one thing that a sustainable socialist society could offer is an entirely different set of parameters in terms of production: governing how we produce, what we produce. It could emphasize meeting essential needs of the population, decreasing waste, organizing technology around use values, not exchange values. Very different kinds of technological choices could be made. It would require democratic planning to make it work, and it would have to be at the local, regional and national, even global, levels. Although all this would take time, the moment we begin to move outside the logic of capital, all sorts of new possibilities will open up with respect to meeting needs and protecting the environment. Right now, however, our production is devoted toward capital accumulation above all else, and in the process, we are destroying the climate. We need to be able to organize a society in rational ways. Currently, there are social and class obstacles preventing us from doing so. Everyone is sitting and watching the climate being destroyed as evident in the extreme weather that is already emerging everywhere, and nearly everyone feels helpless. Why do people feel so helpless? It’s because all decisions are being determined by profit, and we all feel locked into the system, reproducing its logic in our everyday actions even when we are opposed to it. None of the decisions currently being made are being determined based on the principles of sustainable human development—simply by virtue of the fact that we live in a capitalist system where accumulation of capital is king. Yet, we have to remember that while natural laws need to be obeyed, social laws are the product of historically specific systems and can be disobeyed when they no longer conform to social needs. Disobedience toward many of the social laws artificially imposed by capitalism is now necessary. Among its countless disadvantages, one perk of capitalism is that it maximizes the efficiency of production. Nevertheless, this efficiency is always achieved at the expense of natural resources and causes environmental degradation. Do you believe that there is a tradeoff between maximizing efficiency in industrial and agricultural production, and combating climate crisis? Well, first of all, I don’t believe that capitalism maximizes macro-efficiency, though it is relatively good at micro-efficiency (if we ignore the waste built into nearly [every] commodity associated with the sales effort). So, it all depends then on how you define efficiency. Capitalism’s much vaunted efficiency is exaggerated in contemporary ideology. Capitalism defines efficiency mainly in terms of profitability. It has been good at combining inputs and outputs in relatively efficient ways so as to generate profit, keeping labor costs down, while externalizing social and environmental costs. But overall, at the macro level (and even realistically at the micro level—since by far the largest part of the cost of a tube of toothpaste, for example, is associated with marketing) it’s a very inefficient, wasteful and destructive system. How could you call a system efficient, for example, when we are in a process of destroying the entire climate, and with it, all human civilization? If you look at agriculture, all the scientific evidence says agribusiness is a very inefficient way to produce food, although the most efficient way to produce monopolistic profits is by reducing labor costs and maximizing price markups. In contrast, the most efficient way to produce food for people and land use is small-farm agriculture, which is completely opposed to the system that we have now. Improved, small farm agriculture emphasizing permaculture and biodiversity is also superior in terms of providing carbon sinks. Such agriculture, antithetical to concentrated capitalism, is more labor intensive, but more efficient in all other respects. Ours is a waste-based economy, built into the very structure of monopoly capitalism. We are very “efficient” in the United States at producing (or outsourcing) products like plastic straws, which are so cheap that we use them in a drink for a few minutes and then throw them away (where they don’t decompose and end up in the oceans and ingested by fish), after which others have to be produced, which can be used for a few minutes and discarded. In the United States, we consume hundreds of millions of plastic straws a day. We spend [hundreds of billions of dollars] a year in the United States on marketing (targeting, motivation research, product management, advertising, sales promotion, direct marketing). Much of this marketing is considered a cost of production, but it is all about selling things: getting people to buy things that they don’t need or even really want. So, the capitalist system isn’t efficient at all, taking all this into consideration. It is incredibly wasteful, by far the most wasteful system in history, accompanied by abysmal poverty. It isn’t efficient when air and water is increasingly polluted, forcing people to buy bottled water, thus enhancing profits. We have to be very clear about what we produce, how it serves people’s needs in this system. Right now, 10 percent of the world’s population [is] suffering from malnutrition. We have to find ways for them to get food. In the U.S. today, half a million people…are homeless on any given night. We have to find a way to provide people with housing, and so on. A really efficient society by a needs-based criterion would provide people with food, shelter, health care, education, meaningful work and all the other things that people desperately need but don’t have in large numbers. In developing an adequate proposal, it is important to integrate all spheres of life in it. Therefore, I would like to turn to the interplay between allocation of resources and direct democracy, or more specifically, between central planning and local decision-making. Is there a contradiction between central planning in quantifying the needs of all people and the available resources, and local, democratic decision-making? If so, how can we find the balance between the two? I don’t think there is an ultimate contradiction. In order to deal with the kinds of planetary problems facing us, stretching from ecosystems to the climate, from local economies to global ones, we need some kind of centralized planning. But it has to be integrated with local, regional planning and democratic systems of control. This doesn’t mean a command economy where all decisions are made at the top. As John Kenneth Galbraith used to say, corporations constitute their own form of planning system. But their planning is done within a system of institutionalized greed and competition between giant monopolistic firms, and based on the manipulation of the public. None of this has anything to do with democracy and is undermining what little is left of the liberal-democratic state. The fact is that we have very centralized private institutions in the United States and capitalism as a whole, which largely govern the system, and in relation to which, the public is left on the outside. Political theorist Sheldon Wolin used to call this “inverted totalitarianism.” Today, it is a system of surveillance capitalism. Here, corporations and the billionaire class are the primary decision makers, operating primarily in their own interest and in the interest of their stockholders and commanding the state. It is necessary, therefore, to institute democratic planning, providing us with rational choices and real participatory decision-making about the future in areas like ecology. We are faced in our time with a choice unlike that faced by any previous generations. In The Communist Manifesto, Karl Marx and Friedrich Engels wrote of the need for a “revolutionary reconstitution of society at large or the common ruin of the contending classes.” But today, this threatened “common ruin” pertains not simply to this or that society or civilization, but to humanity as whole, encompassing all future generations, and represents the near certainty—if business-as-usual continues—of irrevocable, catastrophic change on a planetary level. In these dire circumstances, there is only one answer possible: a long ecological revolution.